Nurses gave their support to the campaign by signing the Smile With Dignity petition and contributing personal dental stories or stories of their work. They are also helping to raise awareness of the campaign among their colleagues, patients, and networks in their home communities. As dental services and the MSP is a provincial issue, engaging with nurses and communities from across the province will ensure that voices and concerns from outside of Vancouver are also represented in our campaign. Visit the Smile With Dignity website to learn more about the campaign and how to get involved. To Premier Christy Clark: the lack of dental care is scary! This Hallowe’en weekend, the Smile With Dignity dental committee sent a message to our BC premier that the lack of access to dental care is scariest of all. 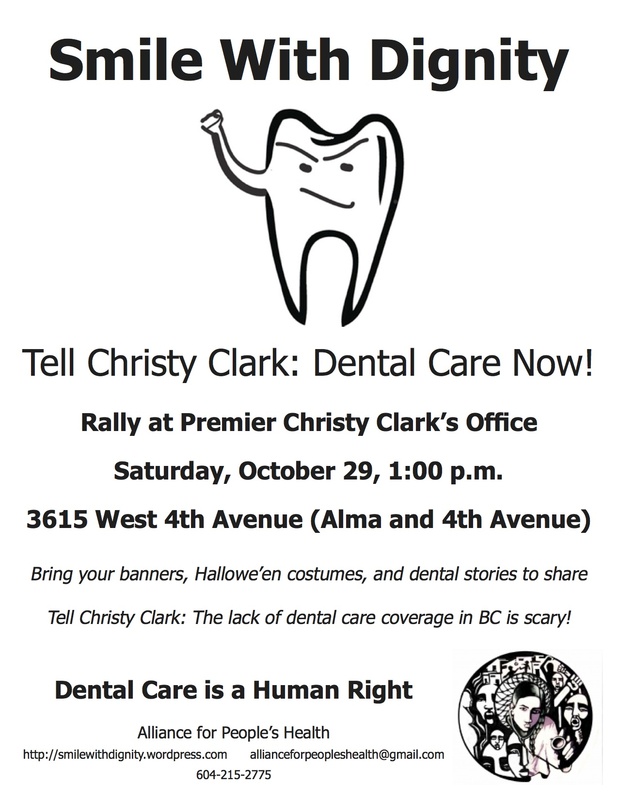 An enthusiastic and vocal group of campaign organizers and supporters (including a contingent from Occupy Vancouver) donned tooth costumes and rallied outside Christy Clark’s constituency office on October 29. 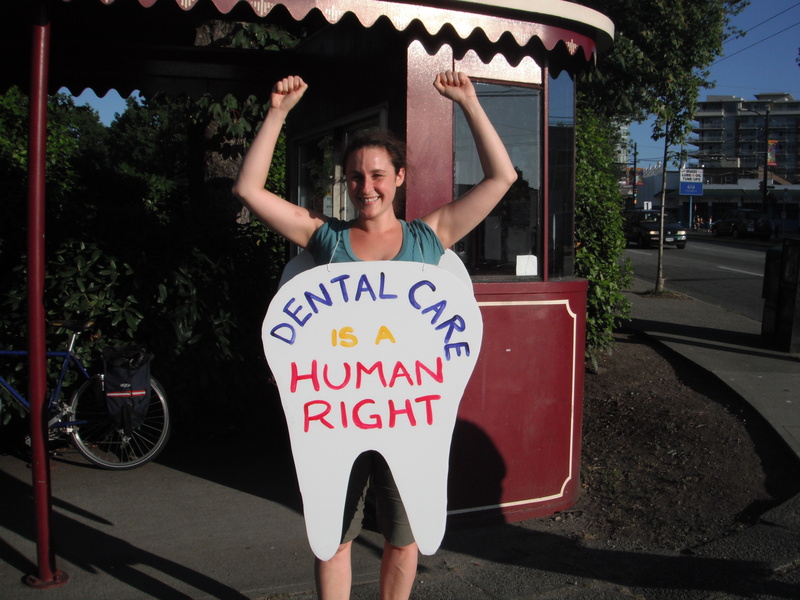 Placards and posters declaring “dental care is a human right” and “universal dental care now” highlight the principle demand of the campaign: to have basic preventative and restorative dental services included in the BC Medical Services Plan. Speakers shared their experiences and frustrations with our broken dental care system, where those without dental insurance must pay out-of-pocket for care – or live with the pain. Richard shared his experiences with his dental plan on income assistance, where inadequate coverage has left him with only 8 teeth remaining in his mouth. Cutbacks to the meager public dental programs leave parents such as Aiyanas struggling with the costs of dental care for his children. The Smile With Dignity committee has been gathering and documenting similar dental experiences from people on the streets (http://smilewithdignity.wordpress.com), and these stories were submitted to Christy Clark so that she can finally hear the voices and needs of our community. From the large number of passersby who stopped to endorse the campaign that day, dental care is an issue that hit a nerve for many. Our health care system is neither universal nor accessible when only those with private insurance or money can get dental care. As health services fall under provincial jurisdiction, we will continue our escalating campaign and public pressure on Christy Clark, BC Minister of Health Services Michael de Jong, and the BC government to make the change. *For those leaving from Occupy Vancouver, we will meet at 12:30pm at the Info Booth (Vancouver Art Gallery) and head over to Christy Clark’s office together. **We will be making posters for the rally on Tuesday, October 25, starting at 6:30pm at the Alliance for People’s Health office at 672 E Broadway (at Fraser). Everyone is welcome! Click on the link above to hear Azar with the APH Dental Campaign Committee in an interview with Rick Cluff this morning. Interview starts at 1:49. Our teeth are not only a vital part of our overall health, they affect the way we eat and interact with others. 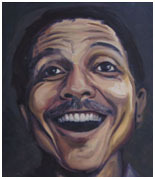 That’s why we call it the “Smile with Dignity” campaign. The right to access dental care is about the right to eat, smile, live and work with dignity. Smile With Dignity Hits the Streets! APH Organizer Mel as the Justice Tooth! The “Smile with Dignity” Dental Committee spent a busy long weekend Friday night (July 29th) collecting stories of people’s teeth and any barriers people had accessing dental care. They also collected signatures for the petition to add dental care to BC’s Medicare. One of the people passing by, who was drawn by our “Smile with Dignity” tooth mascot, was an editor from the Georgia Straight. So we were included in his blog (click for link: Campaign for dental care hits the streets of Vancouver). 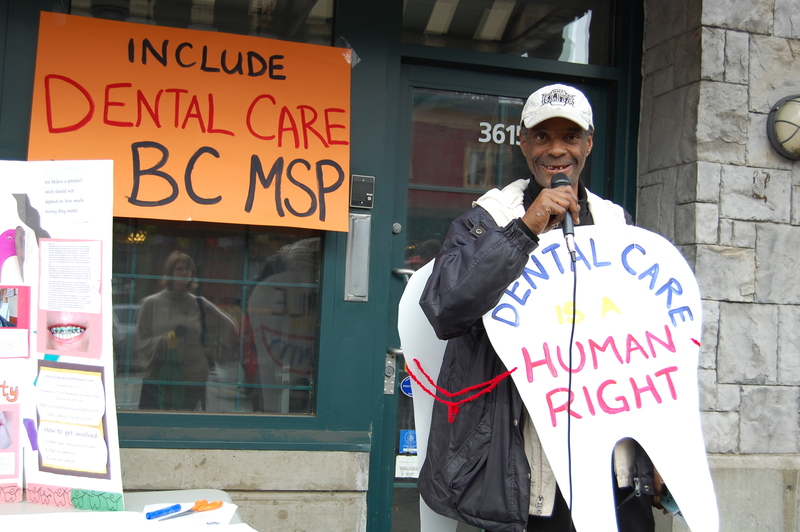 The next organizing meeting of the Smile with Dignity Dental Campaign is on Thursday, March 24, 6:30pm at the Organizing Centre for Social & Economic Justice, 672 East Broadway (@Fraser, accessible by the 99 B-line bus). Why? Because everyone has the right to Smile with Dignity, no matter how much money they or their parents make! All are welcome, and those new to the campaign are encouraged to join us and learn more. Childcare available upon request. Coffee/tea and snacks provided. Join us for our second organizing meeting of the year! We’ll be sharing community stories about issues accessing dental care and strategizing how to expand our campaign demanding access to dental care for all! All are welcome. Coffee/tea and snacks will be provided. Childcare available upon request.